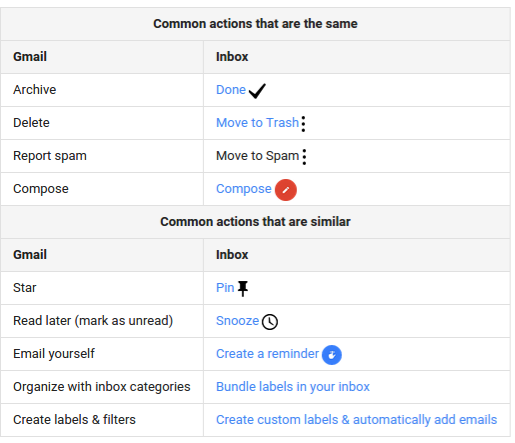 Have you wondered how certain actions performed in Gmail effect Inbox by Gmail or vice versa? Some actions in Inbox are the same in Gmail, possibly with a different name, while other actions are similar. Help me please. I can sign in to my Google account but there's no link to writing or reading gmail. Please respond to gwenyffyr@ymail.com. My Google name is gwenyffyr1@gmail.com. Was hoping to see a feature in inbox. We use calendar invites alot. Gmail allows you to respond to them and in the same dialog box shows you agenda for that day. Would like to see that feature in Inbox.